electorate confused by waning confidence in politicians, worried about security and distressed by chronic unemployment, a respected political researcher told the AAPA on March 28. 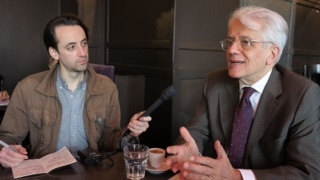 It’s the first presidential election to be held under a state of emergency, Sciences Po professor Pascal Perrineau told a well-attended event at the Falstaff Café on Place de la Bastille. Not only are people preoccupied with economic issues and unemployment, but terrorism and immigration are also weighing on voters’ minds, he said. But, Perrineau says, people have no confidence in the ability of politicians to help them. Perrineau noted if it’s a runoff between Macron and Le Pen, neither has majority representation in parliament or even the beginnings of legislative means needed to successfully govern.